You can send messages to remote users. When it arrives, it will look similar to messages received from the Windows' net send command in Windows NT or WinPopup in Windows 9x. In the field Computer name (host), enter the recipient's network name or IP-address (delays may occur.) Click the button Send. The delivery status (SENT or NOT SENT) will be displayed on the status bar. Message length is up to 128 characters. Instead of sender's computer name, the program will place on the message any name that you specify (the field Name). Such message can be sent using two mechanisms: NetBIOS and mailslots (tick Use mailslots). Mailslots work under all versions of Windows and this mechanism is faster than NetBIOS. Message length is up to 470 characters. It works by executing the net send command and therefore is not available in Windows 9x. Supports sending messages to all network users, domain (workgroup) users, and users connected to your computer (for help on available keys click the button in the upper right corner; appears when this message type is selected). Both options require that the Messenger service must be started on your and remote user's computers. Fig. 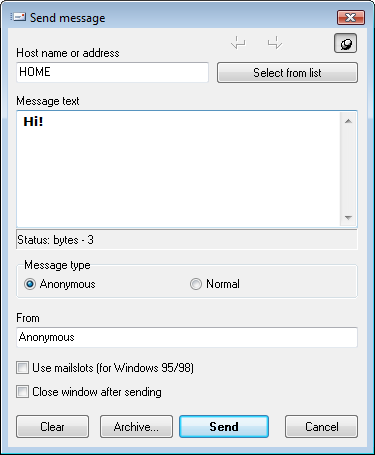 1: The Send message window. You can send message to a group of users: select them on the hierarchical network tree, which appears when you click on the button Select recipients. The message window can close automatically if you select the option Close window after sending. See further sections for information on available hotkeys. If desired, you can maintain the log of sent and received messages. You can navigate through the archive of sent messages using the arrow buttons in the upper right corner. You can quickly reply to messages that you receive (unless the message is anonymous). When new message arrives, press the hotkey WIN+P (default; can be configured), and the Send message window with entered Computer name field and quote of the Message text field will appear (similar to chat).